A few months ago we reported about the development of a new game. After that it escaped our attention until a proud buyer showed his blue cartridge on the MSX Home Computers group on Facebook. Francisco Téllez de Meneses delivered and Matra released. Ghost is out now and everybody with a cartridgeslot can enjoy it. As described on the website of Matra, Ghost is a Metroidvania kind of adventure. A hint to Konami's Maze of Galious is mentioned as well, and rightly so. But where Maze of Galious is situated in a mythical history environtment, Ghost takes place in a futuristic space station. Ghost, the main character in the game, has one mission: a computer went mad and now in control of the Dallas Space Station. This has to end and it is your task to guide Ghost through a puzzle of no less than 100 screens, devided over five maps to achive this. On Youtube Francisco Téllez de Meneses released a video which shows five minutes of game play. This video explains the stuff shown so the viewer already knows what they can expect. The music will put you right back on that comfy end of eighties chair and the graphics can match the products from that era as well. It has all the specs of a a well crafted brand new game from the days gone by. All is presented on a fresh blue cartridge in a colourful cardboard box. As a bonus a mini CD was added with lots of extras and other goodies. All this for a mere € 25,-. So if you're a gamer, this game would be entitled a mandatory recommendation. Please visit Matranet to get hold of your copy. Ordered and on the way . The gameplay in the video looked really smooth and tight and fun, you can tell this guy is an experienced game developer! Looking very much forward to playing it! A really very good game!!! Some technical solutions never seen on MSX at this level! This game is awsome. I did buy it, because I wanted to share shipping cost for Popolon and did´nt expect too much. Wanted to test it and lost one night. Absolutely Metroidgalliusvania. And it even comes better. It´s nice packaging includes a mini CD with maps and artworks on it. I have to go back to the Dallas now. I got my game in the mail on Friday and played through it over the weekend (after having previously played through it on Steam, where it was released under the name "Mini Ghost"), and it was just as fun the second time around. It's such a fantastically designed game, with perfect pacing and level designs, a great challenge level, and graphics and gameplay that really defy all expectations of what the MSX1 can do (seriously, how is this not an MSX2 game?!). I absolutely recommend this wholeheartedly to anyone who even remotely enjoys this style of gameplay, as it's pretty much impossible to be disappointed. And if you like it, I recommend the PC indie game it was based on, too, "Ghost 1.0" -- as well as Francisco's previous game, "Unepic," which is just as amazing. This guy is just a fabulous indie developer through and through, and I am without a doubt a fan of his for life -- I will buy any game he releases from here on out, without question. The MSX version does not feature any of the sub-weapons from the Steam version of the game. The MSX version does not feature the medical bay from the Steam version of the game (though you don't really need it, since you can recover your health by resetting and entering your password to continue). If you're playing with a gamepad, the MSX version is locked to using up to jump, button 1 to attack, and keyboard controls for all other functions. Button 2 is not used, and there is no means of reconfiguring the game's controls. The CD was also a really nice inclusion, though I do wish it would've included the game's soundtrack -- I really like the PSG arrangements of the Ghost 1.0 music! These minor omissions were all initially a bit shocking to me, having come off the Steam version, but I very quickly realized that the game is more fun without relying on sub-weapons, the medical bay is unnecessary, and it takes no time at all to get used to pressing up to jump (it's the Galious way, after all!). And in the end, these are all just nitpicks anyway. The game is, overall, an absolute masterpiece, and should be played by anyone who enjoys MSX gaming. It's so nearly perfect, I have to nitpick in order to even sound remotely critical. Hey, that's exactly what I did! And definitely no regrets here: both are awesome. Is there the big boss in the msx version? There are four bosses, yeah. And they don't move smoothly in the MSX version, but they move consistently -- they move one tile at a time, meaning they're background objects that are being dynamically moved as necessitated by the battle. Amazing graphics. BTW: what we call indie today now far surpasses the big studios from back then. Aackosoft bought games from individuals also and then published them. A lot of what is made for MSX today really is of high quality. I really think often that calling software homebrew or indie really doesn't do it justice. It somehow sounds less, while it isn't. So, only when you are a game studio like Bioware or EA it isn't indie? In the beginning indie meant (ok at least for me) that the game producer also published the game. Now it's all steam or one of the other platforms. On topic: great game, I got it too. Must buy. And don't forget that Matra reissued a lot of earlier published games so a lot of sold out games are now back in stock. Get them while you still can. Because look at the Goonies 'R good enough game for instance: sold out never to return. Prices on Ebay are 5 times the initial price now. Konami MSX games are already an investment, but I also see a bright future for these Spanish gems. 25 euro, how can they make a game with box, cartridge, programming, pcb, electronics and cd-rom for 25 euro, spent time for running a website and going to the postoffice, handle e-mails and customer care and still have food for eating? Let keep MSX alive, support the developers and buy their stuff. Even if you only use emulators. See it as an investment then. It will pay off later. There is nothing wrong with the term indie IMHO. It usually just means that there isn't a 200-man team with a multi-million dollar budget behind it. I generally prefer indie games or games by smaller studios. Ghost looks nice, very good job! Hear, hear! I remember a lot of people were disappointed when the Coleco Chameleon KickStarter died, because they wanted to recapture that feel of buying new, high-quality cartridge-based games, and felt that with the Coleco Chameleon scrapped, that would never happen. Meanwhile, I was over here, buying up games from Matra, MSX Cartridge Shop, Repro Factory, and KAI Magazine, and amassing a huge collection of new-in-box, high-quality cartridge games -- exactly what Coleco Chameleon backers felt they needed a whole new system to accomplish. I say, if you want to collect new cartridge games of staggeringly high quality, look no further than the modern MSX indie scene. This is where it's at, and has yet to let me down. There are new indie games released for MSX practically every month, and virtually every one of them has been a gem! After few minutes of game I was totally captured by the exploration. The level design and the game play are absolutely professional. There is a lot of coding and great ideas in characterizing the different level areas. Is this coming in the direction of what MOAM would be? I get the feeling this is too short a game to really be what MOAM promised to be, but they come from similar roots. MOAM was inspired by La-Mulana, right? And La-Mulana was, in turn, heavily inspired by Maze of Galious. Well, Fran got his start making Unepic, which was itself heavily inspired by Maze of Galious. He then followed it up with Ghost 1.0, which seemed to be heavily inspired by Unepic. And this is a prequel to Ghost 1.0, which wears that original Maze of Galious inspiration on its sleeve even more than Unepic did. So the genre and inspirations are about the same, but I feel like the approach -- and certainly the length -- is probably very different. Cartridge only? 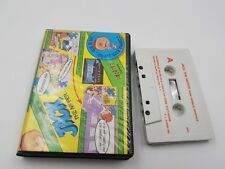 I would buy this if it was cassette.. Would that be possible with this game? Is this game available as paid download? If you want to download and play the Steam version would be the alternative. But, you can always ask Matra. Which has zero post on this site so email would be preferred I suppose. Looking great, what payment methods do they accept? Why would anyone even bother cracking a game that's $2?! Man, people are the worst sometimes! I asked Matra, there is no paid download. Guess I'll play the steam version. "25 euro, how can they make a game with box, cartridge, programming, pcb, electronics and cd-rom for 25 euro, spent time for running a website and going to the postoffice, handle e-mails and customer care and still have food for eating?" It turns out that I lost money with Ghost for MSX. The amount I had to pay for the poster from Azpiri is higher than everything I earned so far. It's a 32Kb ROM, so technically it's possible. Im a huge fan! I bought ghost on msx and also minighost and ghost 1.0 thought i havent played 1.0 yet. Hope to see more of your stuff on msx! I think the awesome cover art was worth it though . Really a big surprise release for me, Ghost, and I was really impressed by the high quality. I too hope we will see more releases in the future . I finished GHOST MSX version... So i just bought the steam version !!! Same deal here. I purchased the cartridge, and devoured the game to its end. It's certainly a new classic for the MSX. i can't find a way to reach the deeper rooms(there are 4 of them if i remember well) beneath the ship. Is there a clear way to reach them?